After a really lovely few weeks of hot weather came along to wrap up August and summer it seems, this week brought with it a definite chill to the air, the seeds of autumn flying in on the breeze, ready to fully bloom sooner than later by the feel of things. Are we ready for this shift; the shorter days so noticable already, the extra blanket on the bed? I’m not sure. Breaking 90 degrees felt good and a series of nights too hot for blankets went a long way to help, but I have to admit the feeling of an especially “short” summer is still here with me, even as we lovingly ready the house for more inside time, plan and dream about our homeschool year, and talk excitedly with friends about what we will be making for the kids for Christmas this year. This week, the farmer felt the beginning of the slow down too. His window for planting most things is past, he will just be sowing more winter greens–seeds of arugula and Asian greens, transplants of mustards and some kale. That is about it besides the big garlic planting. As always, we were behind with some plantings and the time to plant things ended before we had it all done. This has just been the way of things with the limitations one (very hard) worker and a (very hard worked) homeowner’s rototiller have brought to our operation. We feel like we have done an awesome job building the business with our bare hands so to speak, but we are really looking forward to how much more we will be able to grow next year and how much better our timing will be with the help of our beautiful Ford 8N. 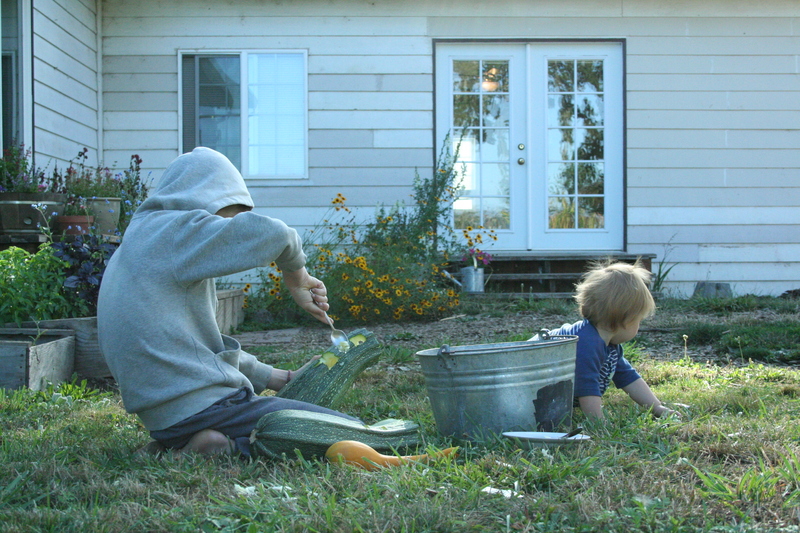 The kids are harvesting overgrown Romanesco zucchinis, carving faces in them with jackets on in the early morning this week. They still want to fill up the mud pit/swimming hole Luca so expertly dug and splash around, but they realized on Monday it was just too cold. It looks like it will warm to the high 80’s again this weekend, and seeing as how our first and last trip to the beach of the summer isn’t happening until the weekend after that, I have to say I am hoping for more warm weather then, too. Otherwise, I realize it is time to settle and embrace the inevitable. The moving of the circle around to the next notch again.